Tom Roster is an independent ballistics consultant and author specializing in the design and testing of shotshell loads for U.S. shotshell and reloading components manufacturers. He is a court-recognized shotshell/shotgun expert witness. 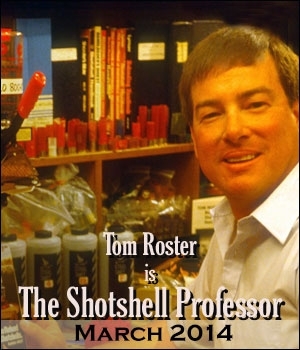 Tom was formerly the Ballistics Research Director at Oregon Institute of Technology and then served as a Ballistics Specialist for the Dept. of the Interior. In these capacities he designed and administered the world’s six most extensive lead versus nontoxic shot duck, goose, pheasant and dove shooting tests ever conducted. He then co-authored their peer-reviewed scientific reports. Roster spends about 100 days afield each year testing lead and nontoxic hunting and target shotshell loads, then traveling worldwide reporting on his findings to industry and wildlife professionals, hunters and shooters, and in his writings for various shotgunning magazines. Contact him in Oregon at (541) 884-2974, tomroster@charter.net. 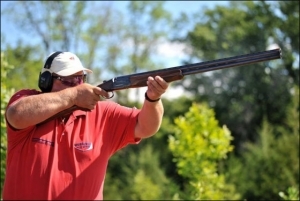 New on the U.S. import scene is a four-load selection of Kent Gamebore lead target loads imported exclusively by Will Krawczyk of W.T. Sherman and Company since January 2015 and conveniently sold on their web site. These British-made shotgun shells will not be “value-priced” cheapies. Instead they have been selected to compete with American-made, high-end, lead-shot target loads. The Gamebore White Gold load being imported is expected to retail at somewhere between $83 to $90 per 250-round case. Two other loads – Black Gold and Platinum Trap − will sell for about $90 to $95 per case. I don’t think anyone could say that U.S. shotgunners suffer these days from a lack of factory shotshell loads. There are now no less than six major shotshell ammunition plants in the U.S. plus a specialty one. As recently as ten years ago there were only three, with no specialty load manufacturers. Additionally, there is at least one company involved full-time in importing and shipping direct to U.S. shooters an Italian-made line of shotshell ammunition. Lastly, there are currently at least three or four shooter groups – mainly in Texas – importing container loads of still more lines of Italian and Spanish-made shotshell ammunition which they then sell direct. Whenever shotgun barrels suffer internal damage, the gun’s owner almost immediately leaps to the conclusion that there was something faulty about the ammunition. It is true that certain forms of barrel damage can indeed be caused by faulty ammunition (see this column January and February 2014). However, as we examined in last month’s Part 1 of this series, certain forms of barrel damage can occur from shoddy barrel modifications through no fault of the ammunition whatsoever. Part 1 covered faulty chamber and forcing cone lengthening. In Part 2 here we’ll examine damage that can occur from faulty backboring, porting, and screw-in choke installation. In my last two columns we examined damage to shotguns that can occur from shooting excess pressure loads (January 2014) and from barrel obstructions (February 2014). In this installment let’s begin looking at barrel damage that can occur from improperly performed barrel modifications. My January 2014 column in Shotgun Life, which discussed shotshell pressures and the kinds of barrel damage excess cartridge pressure can cause, generated quite a few reader responses. Several readers contacted me requesting I also devote a column to barrel damage caused by obstructions. Before going further, any time there’s a topic of interest you would like covered in this column, please e-mail me. I pride myself in being 100% responsive to readers’ interests. Shotshell pressures seem to be a worrisome area for many shotgunners, especially reloaders. They worry that if they shoot excessive pressure loads that their shotgun could well “blow up.” They’ve heard that from their buddies, but they really don’t have any solid scientific evidence to support those assertions. Last month in Part 1 of this two-part series on shot quality, I discussed parameters and standards for shot size designations and pellet sphericity. I spent extra language discussing lead shot because it is still by far the most common shot type used worldwide. To judge lead shot quality objectively there are five areas of concern: shot size designation, shot diameter uniformity, roundness or sphericity, hardness, and plating or lack thereof. In Part 1 here we’ll look at size designation, diameter uniformity, and sphericity. All shotshell manufacturers now have them: high velocity steel loads. You probably already know that most steel loads have higher instrumental velocities than most lead loads. Well, each company now offers even faster steel loads.